Have you heard of Lumineers? If you have been considering porcelain veneers, then there is a good chance that you have. That is because this particular brand is very heavily marketed by Den-Mat corporation. But what you may not realize is that they are just one brand of this new class of ultra-thin porcelain veneers that do not require any tooth preparation. Even though the popular advertising campaign suggests otherwise, you may also be surprised to learn that many Lumineers patients aren’t happy with them. They complain that they look fake, chalky, and in some cases look bulky after the final application. This is partly due to the fact that Lumineers are required to be manufactured at the Den-Mat corporation laboratory. Dr. Coleman would rather use his master ceramist for the veneers he places. He feels that the work of Den-Mat’s laboratory tends to be flat and lifeless in appearance. Dr. Coleman has been creating beautiful, natural-looking smiles using ultra-thin veneers for over 30 years. He feels that a more beautiful smile can be achieved by using his in-house laboratory where a master ceramist can handcraft your veneers to the exact specifications of his smile design. Visit our laboratory page to learn more. Ultra-thin veneers differ from traditional veneers in that they are made of an extremely durable type of porcelain. To give you a comparison, a traditional porcelain veneer is 0.5 millimeter thick and an ultra-thin veneer is 0.3 millimeter thick. Typically to achieve a seamless fit, porcelain veneers require a very tiny portion of the tooth to be shaved down. But ultra-thin porcelain veneers don’t require this step. And although the no-preparation technique is very appealing, it isn’t right for everyone. We would encourage you to consider the importance of selecting the right dentist versus going in with a preconceived treatment plan. Cosmetic dentistry is truly an art form. The advanced skill set required to be an excellent cosmetic dentist comes from extensive training beyond dental school. 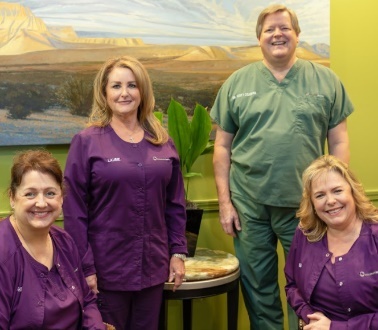 Dr. Coleman is Lumineers certified, but he is also an accredited dentist with the American Academy of Cosmetic Dentistry and is committed to working with only the highest quality materials and talented ceramists. So the best way to determine the right smile design for you is to come in and meet with Dr. Coleman personally. He will analyze your specific case and tell you about the results that can be expected with either no-preparation or traditional veneers. Call 713-783-2800 or visit our make an appointment page so we can begin working toward creating the right smile design for you.